The main failing of design school? In a post on FastCo Design discussing “The Main Failing of Design School,” the headline reads ” … Kids Can’t Think for Themselves.” The article digs into the proliferation of design schools and the desire of students to go into “graphics.” What do today’s graphic designers need to know to be successful? There is concern by the author, Pentagram’s Michael Bierut, that students are being trained on process and the technical aspects, yet are losing (or never had) the ability to think and relate to the business, the audiences, the culture and economy. The men and women who invented graphic design in America were largely self-taught; they didn’t have the opportunity to go to fully developed specialized design schools, because none existed. Yet somehow these people managed to prosper without four years of Typography, Visual Problem Solving, and Advanced Aesthetics. What they lacked in formal training they made up for with insatiable curiosity not only about art and design, but culture, science, politics, and history. We have to agree. We see a lot of portfolios, some of which are very good. And although technical skills are essential, it’s tough to find a young mind that is curious, broad-minded and able to go beyond what’s “cool” or “in” right now. Understanding the situation, the audience perspective and what that audience relates to, perceives and understands is essential to good marketing. It’s also the foundation for good design. The article covers two different styles of design education and the types of graphic designers that graduate from each. Realistically designers need the process and technical skills to start out, but the author notes after a few years in the business, what does it take to be a better designer? To stretch and grow? It takes an understanding of the context of what they are designing for. Business perspective, audience perceptions all impact how the design will resonate or miss the mark. Our clients usually are not other designers; they sell real estate, cure cancer, make forklift trucks. Nor are there many designers in the audiences our work eventually finds. They must be touched with communication that is genuinely resonant, not self-referential. To find the language for that, one must look beyond Manfred Maier’s Principles of Design or the last Communication Arts Design Annual. Who is the audience and what will they respond to? Colors, typefaces, type size, style of images? What’s the essential message and idea to communicate, how will that be supported by design or choice of photography or format? How do you use design to lead the reader through from page to page, or from section to section in a website? How can the design emphasize the most important points/ideas first and drive the viewer to the call to action? Read. Explore. 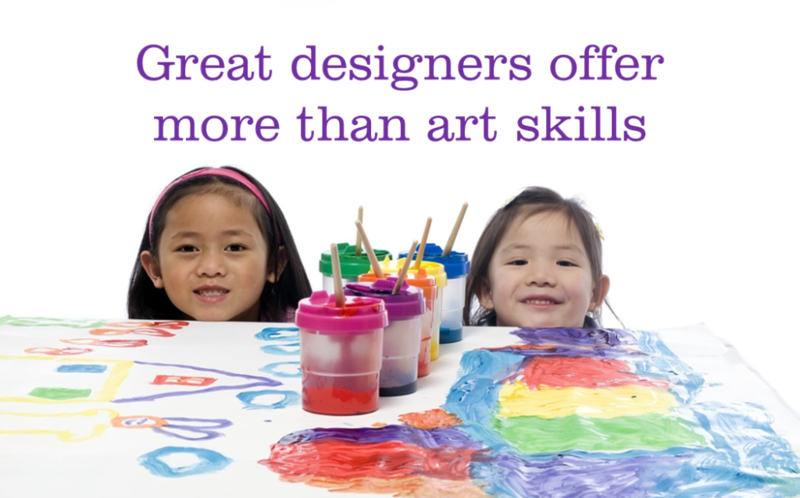 Demonstrate curiosity about industries, careers, products, styles, methods, marketing, communications … and you’ll be a better graphic designer for it. You’ll be more valuable to your employer, and you’ll have work that is constantly challenging and interesting. There are few careers out there that give you the opportunity to learn about so many different businesses, people, expectations and ideas. To do something different each day. To see the impact of what you create. It’s a great business to be in.